Sesderma is a pioneer in the promotion of comprehensive dermatology. These aspects are reflected in our Quality Policy. Sesderma, in its quest for continuous improvement and customer satisfaction, makes known its quality policy which it has developed in accordance with the requirements of its Quality Manual. - Promoting research, development and innovation of new products to meet the needs of people’s skins. To this end we use our knowledge and clinical practice experience, as well as constant communication with professionals. - We offer our customers products with high added value, in terms of safety, quality and quantity of active substances, demonstrating our commitment to the welfare of people’s skin, in turn complying with each country’s legal requirements, and striving to satisfy our customers. - We guarantee a satisfactory customer service including active listening. - We continuously improve our management processes increasing our effectiveness and efficiency. - We encourage professional development, training and employability of our human resources through continuous and specialised training. The Quality Management System of Sesderma is endorsed and supported by ISO 9001 certification since April 2005. 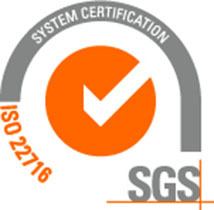 The ISO 9001:2008 certificate is additional to the ISO 22716:2007 certificate ‘Guide to Good Manufacturing Practices for Cosmetic Products’ issued by the SGS Certification Entity in November of 2013. Sesderma also has a certificate for Compliance with Good Manufacturing Practices (GMP) for Cosmetic Products, issued by the Spanish Agency for Drugs and Health Products (AEMPS) since February 7, 2014.